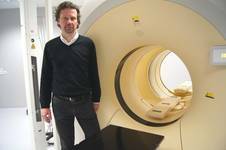 Brussels Europe Hospitals run a private Radiotherapy and Oncology Department. 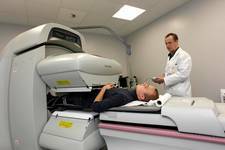 The External Beam Radiotherapy department is fully equipped for modern external beam and HDR-brachytherapy treatments. Close interaction and collaboration with and easy, rapid access to the Radiology Department (CT and MRI examinations) and the Nuclear Medicine Department (scintigraphy and hybrid molecular imaging, including daily contact with a Petscan Unit) ensures that the treatment offered is the very best available. Low dose rate brachytherapy for prostate cancer is one of the cornerstones of our Department. As one of the pioneers in Belgium in this field, we launched the prostate seed programme in our hospital in 2001. All implants are performed by Carl Salembier, MD (Radiation Oncologist) and Mr Alex Rijnders (Physicist) in close collaboration with the referring urologist. Thanks to the specific, personalised implantation technique, the use of stranded seeds, the number of patients treated and the excellent results achieved, we have received national and international recognition. One of the leading firms in radioactive material (GE-Oncura®) even named us a Reference Centre in this field. We have also provided training to many new national and international centres. The Oncology-Haematology Department offers a modern, fully equipped Day Clinic for all chemotherapy treatments. The rooms at the Day Clinic were recently completely refurbished to create a more 'homely' atmosphere. All oncology cases are discussed by a multidisciplinary board (surgeons, radiotherapists, oncologists, pathologists, radiologists and organ-specific specialists) and all patients treated according to international guidelines. A specific Breast Cancer Clinic (gynaecologists, plastic surgeons, radiologists, pathologists, surgeons, radiotherapists, oncologists, a breast nurse and a psychologist) was recently set up and offers fast and intergrated work-up and treatment. We offer a high-level treatment for all types of cancer in adults. Clinical oncology, medical oncology, radiotherapy and haematology treatments are performed following international guidelines. Specific areas of interest are prostate, breast, digestive and gynaecological cancer treatments. For all these pathologies, either localised treatments (conformal radiotherapy, IMRT, seed brachytherapy or High Dose Rate Brachytherapy) as systemic treatments (chemotherapy, hormonal treatments and molecular target therapy) are fully available and routinely performed. All staff (doctors, nurses and technicians) speak Dutch, French and English; many speak additional languages too. As a private centre, we strive to achieve rapid and high-level work-up and to initiate all oncological treatment as quickly as possible. All new patients are offered a consultation within 48 hours.